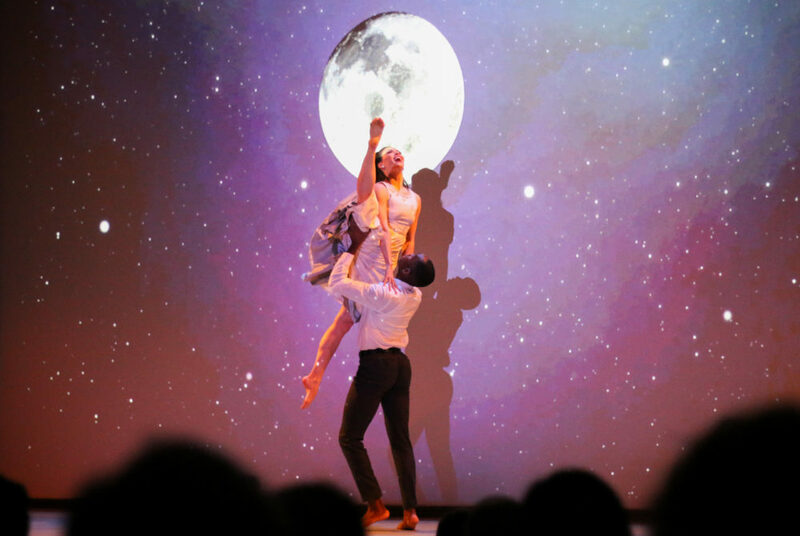 Two dancers perform in front of an image of the moon provided by NASA during "We choose to go to the Moon" at the National Portrait Gallery Wednesday. Alumnus and professor Dana Tai Soon Burgess collaborated with two Smithsonian museums to create a performance about the significance of space in U.S. history. Burgess, who graduated with a master’s degree of fine arts in 1994, worked with scientists from NASA and the Smithsonian National Air and Space Museum to choreograph “We choose to go to the Moon” – a 35-minute piece that was inspired by former President John F. Kennedy’s 1962 speech by the same name. Nine dancers – including four alumni – from the Dana Tai Soon Burgess Dance Company will perform the show Saturday and Tuesday at 6:30 p.m. at the National Portrait Gallery. The performance begins with audio from Kennedy’s famous speech and songs that relate to space from the 1950s and 1960s like “Fly Me to the Moon” and “Catch a Falling Star.” It also includes audio from five interviews Burgess conducted with NASA scientists and astronauts, each showing a different perspective of humanity’s relationship with the cosmos. Burgess said he got the idea for the performance when he sat next to a NASA scientist on a flight to Santa Fe, N.M. and the pair discussed parallels between dance and science. Burgess said the encounter was very “serendipitous” because the woman on the flight helped put him in contact with NASA and made the research element of the piece possible. Burgess said he became fascinated with what became known as “the greatest generation,” or the generation that took on the challenge to go to the moon, especially since his father was a part of it. “There was a whole level and layer of the personal that was built into my research,” Burgess said. Much of the movement and choreography reflects the style of dance that was popular in the era of the space race. “It has all these different vignettes that then sort of lead the audience through, not just scientific information, but through nostalgia, through different perspectives of what the cosmos means to them and then arrives at this place where, essentially, we make it to the moon and we look back at Earth,” Burgess said. The dancers perform in front of images provided by NASA of the moon and the Earth. Burgess collaborated with video designers to make the images projected behind the dancers move in time with the score, adding an interactive element to the piece. Burgess became the Smithsonian Institute’s first ever choreographer-in-residence in 2016. As a choreographer at the Smithsonian, Burgess works with curators and historians to give new life to the museums’ collections through dance. Burgess said he knows what exhibitions are coming to the Smithsonian museums several years in advance so he can connect the dance company’s existing repertoire to the exhibition or choreograph a new piece.